You love your adopted child, more than anything in the world. In fact, you don’t even think of them as “adopted” — they’re your child as much as any biological child is, and you wouldn’t change the way they came into your life for anything in the world. Perhaps you’ve pondered the idea of adding another child to your family for a while. And, at this point in your life, adoption may not be the right answer. Perhaps, this time, you’re ready to try surrogacy as an alternative family-building method. 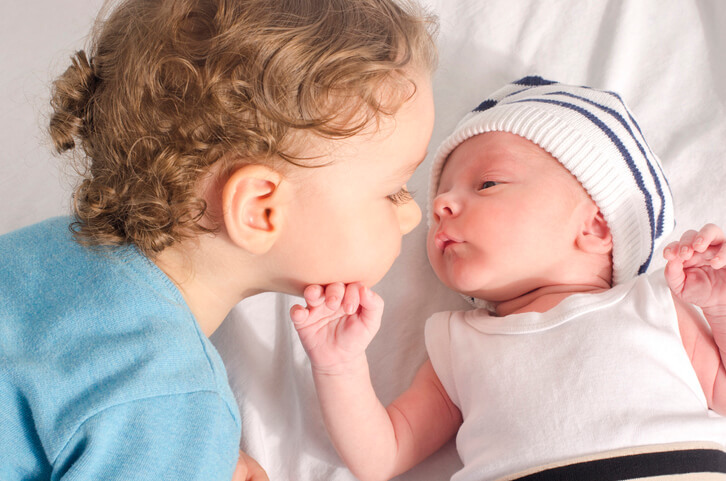 You’re probably pretty excited — but you probably also have a few concerns about adding a surrogacy-born, biological child to your family after already adopting. We know how complicated this situation can be. Choosing a way to build your family is never easy, and we know that both surrogacy and adoption come with their own pros and cons. Fortunately, here at American Surrogacy, our specialists have experience with both family-building methods, and we’re happy to help you decide which path is best for you. You can always call our specialists at 1-800-875-2229(BABY) to discuss these options and what they will mean for your family. In the meantime, learn a little bit more about pursuing surrogacy after adoption below. The desire to have a biological child is one that many people share. Even if you’ve initially grieved the loss of having a biological child in order to adopt, you may still be curious about what having a biological child would be like. So, now that surrogacy is an option for your family, you may be considering it. It’s 100 percent normal to have conflicting emotions when pursuing surrogacy after adoption. Like all nontraditional family-building processes, it’s not always an easy path — but being prepared can go a long way in making sure your journey is as positive as possible. For many people, gestational surrogacy is a once-in-a-lifetime opportunity. If you are at a point in your life where this path is right for your family, you may think you “have” to take it, because when else will you get the chance? However, surrogacy is a complicated emotional process (just like adoption), and it’s not something that your family should rush into without thinking hard about the pros and cons. It’s no secret that one of the biggest reasons for pursuing gestational surrogacy is a biological connection to a child. But, if you’ve already adopted a child, you should have properly grieved that dream. If you haven’t, and you pursue surrogacy because of a long-buried desire to have a biological child, it may cause problems in your future relationships with your children — biological and adopted. Often, there are a few factors that lead to intended parents pursuing surrogacy after adoption — and that’s okay. It’s just important that you are aware of these motivators and exactly what they reveal about your family’s current state. When you have an adopted child, you have to commit to celebrating where they came from. Even though they are not biologically related to you, you love them just as much as you would any other biological child. When you decide to have a child via surrogacy, it can seem contradictory to what you’ve told your child all their life — that genetics don’t matter. Depending on the age of your child, they may have a negative reaction to the news that you are having a biological child. They may be worried that you will prefer your biological child, that they were simply a “placeholder” until the biological child came along, etc. Without proper preparation, this conversation can quickly go south. Your surrogacy specialist can always offer tips on how to handle this conversation, but you must be prepared for some difficult conversations now and in the future. It may take time for your child to warm up to the idea of a new sibling and gestational surrogacy, and you will need to be patient with them. Don’t just assume that your older children will be automatically well-adjusted when you pursue surrogacy after adoption. Similarly, when your surrogate is pregnant, a lot of your time and attention will go to her and your developing child. This can be stressful for any older child but especially for children who are adopted. Because they weren’t able to see how excited you were while waiting for them to come into your life, they may think your excitement about your biological child is greater — and that they are not important. Whether adopted or not, children can have difficulties adjusting to younger siblings. You’ll need to expect those difficulties and consider the nuances of having a biological and an adopted child in the same household. Make sure to focus time on your older child during pregnancy and after the new baby is home; continue to celebrate their adoption and emphasize the fact that you will love both them and their sibling equally, no matter where they came from. This is incredibly harmful language, and it may even be used in front of your adopted child. It’s important to be ready with your own responses that nullify their implications (that adoption is not a “real” family-building method) and celebrate your older child’s adoption story. At the same time, you may get judgmental comments from those who see you pursuing surrogacy as a way to “make up for” choosing adoption for your older child. They may shame you for your family-building choice, asking you why you didn’t “just adopt” again. It can be hard to feel like you’re “darned if you do, darned if you don’t” when it comes to choosing between adoption and surrogacy to bring another child into your home. If you feel comfortable doing so, take this as an opportunity to educate about gestational surrogacy and adoption — and why certain parents may choose one option over another. But, remember that you don’t owe anyone outside of your immediate family an explanation as to why you chose the path you chose. The only thing that matters is what is right for your family. Previous Previous post: Should You Be a Compensated or Altruistic Surrogate?